IsatPhone Link is a low-cost, fixed, global satellite phone service. It provides essential voice connectivity for those working or living in areas outside of cellular coverage. Terra 800 is an all-in-one satellite terminal that operates with the Inmarsat “IsatPhone Link” service. Terra 800 is specifically designed to be utilized in a wide variety of land based applications; such as a dedicated telephone service or a back up emergency telephone system that can be deployed throughout the world. Featuring an intelligent RJ11/POTS interface, it enables connection of up to 5 standard corded/cordless phones or integration to a PABX system. 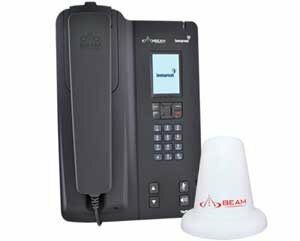 It can support cable runs of up to 600m(2000ft) and incorporates an in-built intelligence to support standard ring, busy and dial tones.